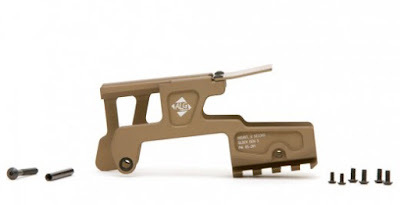 In a sea of go fast components for rifles and pistols, I have found ALG Defense to be a very affordable option combined with top level quality and some really great innovation. ALG has delivered the market great trigger upgrades for the LEO and Military market which still comply with trigger pull and other restrictions, and their super lightweight AR15 handguards are one of my favorite AR15 build accessories. Over the last two years ALG also introduced muzzle brakes, a "match" AK Trigger, low profile super strong gas blocks, a Magwell Funnel and now this 6-Second Optic Mount for the Glock series of pistols. Though the ALG 6-Second Mount may appear to be yet another 3Gun competition accessory, it was actually developed based on the direct request of a counter-terrorism unit who approached ALG. The team had very specific criteria it needed to mount a red dot sight to a Glock. Now this might not seem like a revolutionary idea, however the typical mounting options had problems. As we have heard from competitors on the 3Gun circuit, slide mounted red dots take a horrible beating which delivered a short service life before repair. Many competitors found that Aimpoint Micro sights could take more abuse, however mounting the Micro to the slide still delivered a weaker slide due to the milling and a punishing environment for a sight which could potentially deliver failure at the worst possible moment. The counter-terrorism team wanted to get their prefered Aimpoint Micro sight mounted to the frame to improve balance during cycling and improve red dot reliability over the longer term. On top of a very robust sight mount that could survive “entry work”, they also wanted to retain the lower picatinny for a weapon mounted light. ALG Defense delivered a 6061-T6 billet machined aluminum mount which is designed for Gen 3 Glock 17, 22, 24 31, 34 and 35 and specifically designed to fit the $650 Aimpoint Micro. The Micro is a renowned for its very high reliability, service life and battery longevity, however my one gripe with this mount is that if you don’t want to use a Aimpoint Micro you cannot use the mount… and my preferences would be to have a reflex style of sight. Hopefully ALG will begin offering this in a more universal type model with extended compatibility to other red dots and reflex sights. For tough guy folks who may have their gun whacked with a very heavy blunt instrument as they breach a door would definitely have the need for the Aimpoint Micro and they also believe that sight to fit their needs. As a guy who would rather use this on a more competition on general purpose home defense gun, I find the Micro or any other similar style red dot delivers a much more restrictive field of view which is only amplified when the red dot is well over a foot from your face on a pistol versus inches away like on an AR15. The dot also gets harder to find in the tube gets further away from the eye. The team which contacted ALG will undoubtedly train with this pistol to take advantage of all the speed the Aimpoint can offer. Despite my many calls to Aimpoint over several months to attempt to snag a Micro for testing in this evaluation, I ended up having to use the very durable and affordable Primary Arms Micro Dot as a stand in sight. Shockingly Primary Arms has been delivering some pretty awesomely affordable optics and their Micro Dot red dot sights just happens to have the same mounting plate holes as a Aimpoint Micro. This allowed me to just bolt up the PA Micro Dot which sells for around $100 vs shelling out $650 Aimpoint for this article. The PA Micro Dot is not a top end equivalent to the $650 Aimpoint, however it's a hell-of-a sight for $100 and delivered zero problems over the course of well over 1000 rounds. I pulled out my rather custom Salient International tuned Glock 17, with an ALG Defense Magwell and KKM Match barrel and brake for testing. The mounting is incredibly easy. Due to the mount sitting so low over the slide, the rear sight does need to removed to allow for the slide to be removed for cleaning. Drive out the trigger frame pin, attach the Aimpoint Micro to the mount and then slip the ALG 6-Second mount onto the picatinny rail of your Glock. The mount is then secured to the pistol via an included replacement trigger pin and picatinny mount pin. The entire mount is rock freaking solid once mounted and I experienced no zero shifting during my testing. It took some time for me to retrain my eye, but I got there after a few magazines. After that I really started to have some fun. The mount is spectacularly finished and far more secure than other Glock focused optic mounts I have tested and used before. Once your eye gets retrained to look for the red dot versus the iron sights, the sight is incredible fast and surely does the job the counter-terrorism team needs it to. The quality is impeccable and the machining is very detailed as you would expect on a $250 red dot mount for a $550 Glock. 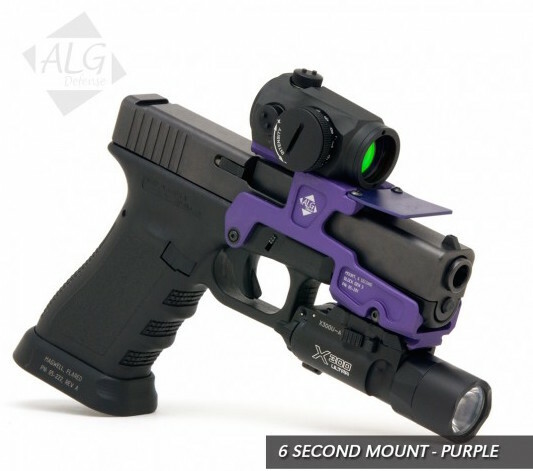 Along with availability in Black, Grey, DDC (color I tested), and Purple ALG has seen to the extra details such as some lightening cuts to reduce weight, added a blast shield to prevent the front lens from getting hazed over from muzzle blast, and has even worked with a couple companies to deliver a holters solution. Likely users will just carry the gun as equipped or use some type of universal or competition style holster. Although I am not a counter-terrorist dude, I can imagine the needs of ripping a door off its hinges and a team spilling through a door with only 6-Seconds to remedy the situation or get shot. The setup is fast and durable all while delivering the benefits of a red dot to a Glock.